The term Neo-impressionism describes an art movement, led by Georges Seurat until his tragically early death in 1891 and then by Paul Signac. It was a reaction against the spontaneity of Impressionism and espoused instead theoretical and scientific ideas about colour theory, composition, optics and psychology. In pursuit of these theoretical objectives, Georges Seurat and Paul Signac developed meticulous methods of paint application whereby juxtaposed strokes or dabs of pure colour, fused and mixed in the viewer’s eye. Its exponents believed that this gave the surface of the picture greater vibrancy – rather than the artist mixing pigments on the palette the eye of the beholder reacted in a similar way to the minute arrangements of pure colour. As Paul Signac wrote ‘the separated elements will be reconstituted into brilliantly coloured lights’. 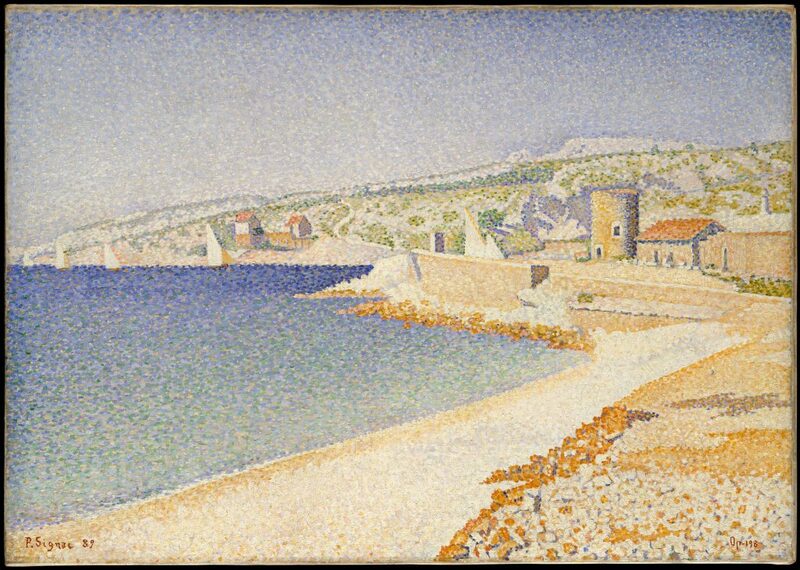 Depending on how the artist applied the paint, this method came to be described as Pointillism, if the paint was applied as precise dots, or Divisionism if small strokes were used. Seurat preferred Divisionism or the rather clumsy term Chromo-luminarism. Camille Pissarro described the new style as ‘Scientific’ Impressionism as opposed to ‘Romantic’ Impressionism. 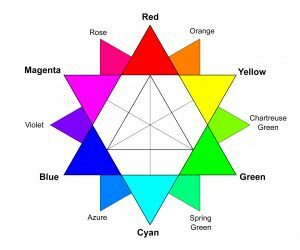 In addition to the theories of Chevreul and Blanc regarding optical mixture, the former also published a treatise looking at the relationships between colours, in particular between complementary colours – those opposite each other on a colour wheel. He found that when two complementaries are juxtaposed the result is an increase in intensity in the ‘simultaneous contrast’. This is particularly noticeable when orange and blue are placed next to each other – the orange greatly enhances the vibrancy of the blue. Seurat thought about these matters when choosing a frame for his work. After experimenting with the white frames favoured by the impressionists, he began to add a pointillist blue border around his paintings which often extended onto the frame. In 1879 the American physicist and mathematician Ogden Rood published a treatise on Modern Chromatics which further explored the laws of ‘simultaneous contrast’. He also stressed the need for artists not to slavishly follow set rules and put forward the work of J.M.W. Turner as an exemplar. The 1881 translation in French had a very considerable influence on the Neo-impressionists. Later, in 1886 Seurat came across the work of Charles Henry, a mathematician, librarian, aesthetician and general all-round polymath. Building on the work of Hermann von Helmholz and others, he was working on theories which were grouped together under the term psychophysics. One of the aspects of this work was a wish to unite science and aesthetics and he put forward ideas about aesthetic pleasure: colour and line should be treated as autonomous elements each having an emotional value for the observer. For example, upward curves were said to have an uplifting effect and downward curves a corresponding suppressing quality whereas horizontal lines were calming. These ideas regarding colour and line were central to the art of the Neo-Impressionists as they strove to give their painting a rational underpinning.